“[Trump's] supporters, including over 80% of the evangelical community, are thrilled with President Trump's actions so far. The fact that the mainstream media and the Establishment (on the left and the right) remain in attack mode with their often baseless and dishonest claims against Trump is a sign that President Trump is doing a wonderful job." -Liberty University President Jerry Falwell Jr.
“I look forward to speaking to this amazing group of students on such a momentous occasion," President Trump exclusively tells CBN News. Calling it an honor, the president also told us, “Our children truly are the future and I look forward to celebrating the success of this graduating class as well as sharing lessons as they embark on their next chapter full of hope, faith, optimism, and a passion for life." Liberty University President Jerry Falwell Jr., who is very close with President Trump and one of his most prominent evangelical backers during the 2016 presidential campaign, says graduates will get to hear from a man who is, “champion of the average American citizen, including many who felt forgotten and neglected by the establishment." Falwell Jr., his wife Becki, their children and daughters-in-law were all at The White House this past Thursday, strictly as a social visit with the president. “I am proud to call Jerry Falwell Jr., his wife Becki, and their entire family my friends," President Trump tells CBN News. Jerry Falwell Jr., tells CBN News that Trump is off to a great start with evangelicals. “His supporters, including over 80% of the evangelical community, are thrilled with President Trump's actions so far," he says. “The fact that the mainstream media and the Establishment (on the left and the right) remain in attack mode with their often baseless and dishonest claims against Trump is a sign that President Trump is doing a wonderful job." Falwell is hitting on a key point, which is, there seems to be a big disconnect between what the mainstream media is reporting and what evangelicals think of the job Trump is doing. The headlines always report turmoil or “hair on fire" scenarios. But the evangelicals who supported Trump don't see it that way. Even if they think he could tone down the tweets, they think he's delivering on promises and is the kind of president they thought he was going to be ... so far at least. Donald Trump is no stranger to Liberty University. He spoke at the university's Convocation in both 2012 and 2016. When he spoke to students last time, he received plenty of applause but of course the mainstream media headlines were all about how he quoted from, "Two Corinthians" instead of saying, “Second Corinthians." It turned out that incidents like that just didn't matter as he went on to capture the highest percentage of evangelical voters ever by a presidential candidate. By the way, the last sitting U.S. president to speak at Liberty University's Commencement was George H.W. Bush in 1990. Brody File analysis: “Word on the evangelical street" is that President Trump is doing very well. They're very happy. He's sticking to his word and staying loyal to them. That's not surprising considering that Donald Trump is fully aware that he wouldn't be Commander-in-Chief if it weren't for evangelicals. They turned out in record number for him. He's not stupid. He knows he needs them to stay happy and show up in record numbers again in four years if he wants an encore performance." 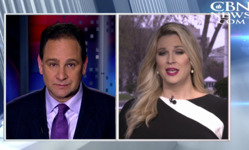 CBN News White House Correspondent Jennifer Wishon: “Accepting the invitation to speak at Liberty University as the commencement speaker is just the president's latest move with a nod to evangelicals. We can go down the list. One of his very first moves in office was to reverse the Mexico City Policy, which pulled back any U.S. tax dollars being used to perform or educate about abortions overseas. He nominated a pro-life justice, Neil Gorsuch to the Supreme Court and he's rolled out a plan to repeal and reverse Obamacare. Additionally, while he hasn't acted yet, the president has reaffirmed his commitment to repeal the Johnson Amendment that puts speech restrictions on pastors and churches. He made the commitment again during the interview he did with CBN News in January. He's also reaffirmed a commitment to help Christians overseas facing genocide at the hands of ISIS. On the religious liberty front, many Christians are still waiting for the president to issue some reassurances here at home—whether that comes in the form of an executive order or signed legislation—but it's clear he's not forgotten the huge swell of support he received from evangelicals in November or the promises he made."